SHREVEPORT, Louisiana – The Western media often portrays terrorists and extremists as a unique manifestation of Islam and the cultural clash between modernity and religion that is occurring throughout the Middle East, North Africa, and Asia. However, less vigorously reported, but no less prevalent, is the increase of hate crimes in the United States. Most recently, a group which was thought to have perished in ignominy has once again exhibited its extreme hatred of African-Americans, perhaps as a result of the United States’ 2012 Presidential election. There are some in America who are virulently opposed to President Barack Obama not as a consequence of political, economic, or social differences, but simply because he is a man of color who had the ‘temerity’ to think that he could be President of the United States. This type of xenophobia and hatred was regularly displayed post-9/11 when many Sikh men, who are not Muslim and wear turbans, were targeted and in some instances killed because their assailants thought they were Arab. 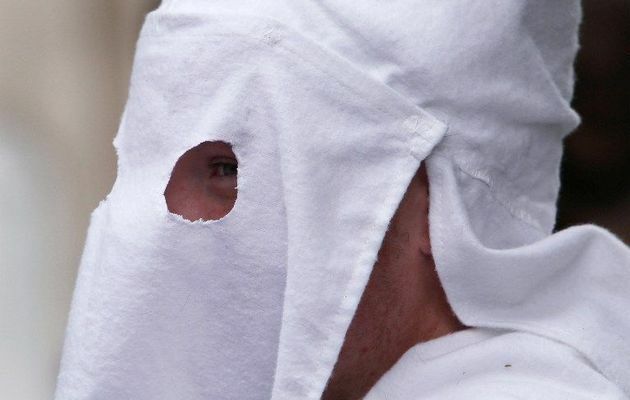 On Sunday, 21 October 2012, a young black woman by the name of Sharmeka Moffitt, 20, alleged that members of an American hate group called the Ku Klux Klan attacked her while taking a walk in a park in Winnsboro, Louisiana. According to her statement, she was attacked by three men wearing hoods who then doused her with a flammable liquid and ignited it. She is listed in critical condition. Thanks to one of our readers, we have been informed that Ms. Moffitt now admits that she made up the story in an apparent attempt to obfuscate the circumstances surrounding her burning which was the result of a failed suicide attempt. However, the reason this story resonated with so many people, including me, is the fact that the 2012 U.S. election cycle has provided ample opportunity for members of the 'far right' and 'white supremacist' like the man wearing the tee-shirt above, to espouse their views openly in various media outlets without fear of sanction or reprisal. These bad deeds in no way justify Ms. Moffitt's actions, but the fact remains that racism, sexism, religious intolerance, and homophobia are on the rise in this country. Thus, even the spectre of the Ku Klux Klan evokes an immediate deep-seated visceral response in even the most reasonable people. For Americans, the KKK is a dirty secret, a racist group that terrorized and killed thousands of African-Americans because members of this organization espoused white supremacy. In 2008, Americans hoped that this painful era of our history was successfully banished with the election of the first African-American President, in 2012 sentiment has proven otherwise. "The Ku Klux Klan is the name of three distinct past and present far-right organizations in the United States, which have advocated extremist reactionary currents such as white supremacy, white nationalism, and anti-immigration, historically expressed through terrorism. Since the mid-20th century, the KKK has also been anti-communist. Ms. Moffitt has become the unfortunate symbol of the ascendance of racism in America. At a time when America hoped to present itself and view itself as a nation of equality and 'post-racialism,' the rancor and hatred exhibited in the 2012 election serves as a stark reminder that racism and other areas of discrimination are resurgent. American terrorist groups like the KKK should be added to the list of international extremist groups like Al-Qaeda or the Taliban, and as such, should be vigorously pursued, targeted, and eliminated for the good of all.